In October I participated in the FLiRTS (Fab Little Random Treasures) swap on flickr and sent off that Halloween 241 tote and witches hat that I shared with you earlier. Well you can't believe the absolutely gorgeous pillow that uberstitch made for my living room chair. It perfectly matches the crochet afghan that I made for Steve the other year. It adds much needed color in an otherwise beige room. I love it! Thank you Pam from uberstitch! Do you remember the Crate & Barrel table linens that my mom bought me in December? Well I finally got them out and turned them into new pillows for our sofa. It's a great sofa, nice and comfy but it's such a deep dark blue, midnight really, that it needed something light. Our living room and dining room are basically furnished in blues yet I've discovered that it's lacking contrasts. 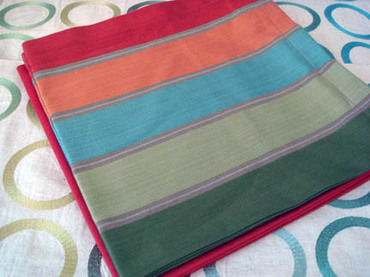 When we saw these place mats and cloth napkins we knew that it was exactly the pizazz needed. They make me think of colorful mosaic pottery. The center dark green stripe was much wider than the others. That was quickly fixed with a few pin tucks. Voila! The weekend visit from my mom was filled with lots of talking, laughter, weeding, talking, organizing, shopping, and yes, more talking. We organized the garage shelves, the hall closet and the shelves above the washer/dryer. Then she helped me trim the lemon tree while I did a little weeding. I'm still sore! Sunday morning after Steve treated us to breakfast, I treated mom and me to a much deserved manicure. After showing her my unfinished wall-hanging quilt that was destined to go above the sofa in the living room we went shopping for accessories. I kept fighting my original color scheme and then realized that the quilt would look so much better in the guest room. Ah ha! Now I was a bit more free to choose something that would work better against all the dark blues in the living room. I needed accent colors! Mom suggested we look at the napkin section as potential pillows. Sure enough, these graphic stripes and circles jumped out at me. So mom treated and now I will soon have some pillows in the living room. Then in a blink of an eye the trip was over and she was flying home. Thanks for the visit Mom! This is the view of my backyard that I see whenever I take out the trash. It's good that it's springtime because all the plants that were planted last summer are really starting to be established. Well, except for a few loses that we had due to the unusual frost this past winter. I had to replant a few lantanas and a lavender sage bush. Of course I didn't have access to the same nursery source that the landscaper had so I made do with the smaller pots that you can get at Home Depot. They'll just take a bit longer to get to the same size, but that's okay. There's still a few missing plants that should be replaced. Only one of the kanga paws survived and I'd really like to get two more to take their places. Otherwise I'm really happy with how it's turning out. The roses are climbers and need to have some sort of trellis or stainless steel wire mounted for them to train on. I read one source that said not to do anything with them for the first couple years and then to train'em. I don't know, I'm not familiar with growing roses. Does anyone have any suggestions? Do you ever feel like it's just one thing after another? Well Monday night I clogged the kitchen sink. (Yes, I should have known better than to put the burned rice down the garbage disposal. Lesson learned, believe me!) The plumber wouldn't be available until after 10pm so I asked if they could come Tuesday morning instead. Tuesday came and the plumbing company said that no one would be available until the afternoon, but I had an appointment I couldn't cancel. Finally we arranged for someone to come yesterday morning. Plumber showed up and promptly made a mess. Water was all over the floor and he got water into the electrical outlet under the sink (for the garbage disposal and dishwasher). Hmm, you know that water and electricity don't mix, doncha? I'm not sure that this guy was thinking because we then smelled smoke. I ran into the garage and turned off the circuit. Oy! I really don't want the house to burn down because of a clogged drain. He finally fixed the clog after 1 1/2 hours, during which he complained to me about having to drive far for his next appointments. Then he complained to a friend on his cell phone about having to fix this stupid clog. I decided that I needed a sewing break this afternoon and tackled the porch. It's been a bit barren looking and needed some touches of color. The pot used to have some colorful flowers in it, but they died last July. Needless to say, I've been a bit slow to replace them. It also turned out that I put the wrong plants together. Some wanted drought and others wanted the rainforest. It was fated to go badly. 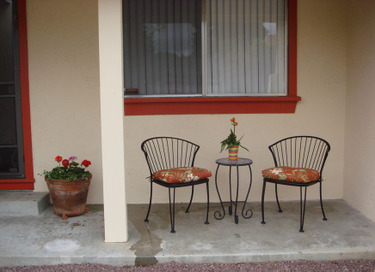 So they went out and the standard never-fail geraniums went in.I found the cute little metal chairs from Costco, the tiny mosaic table from Bed, Bath & Beyond, the chair cushions from Lowe's, and the plants from Home Depot. Spring is at our porch! 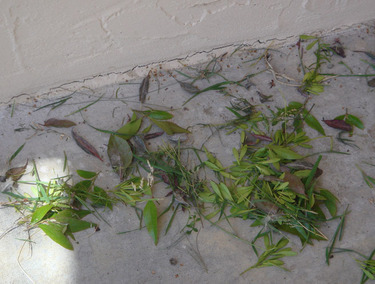 This is the remains of a little nest in the eaves of our porch. Apparently two amorous birds have decided that this would be the ideal place to store some eggs. Luckily we've discovered this BEFORE any eggs were deposited. Otherwise it'd just be too cruel to destroy the nest. It's a very fragrant nest due to the use of pine needles and leaves from the lemon tree. I'll have to keep a close watch to make sure that they don't come back to rebuild. Last week was also a busy one since I started a new work project and I turned 39 on Thursday. Just one more year before the big 4-0! Steve took me to Il Postale to celebrate. It's a cute little Italian restaurant that's in the same building as the old Sunnyvale post office once lived. It's a nice piece of local history, plus they have outstanding food. And I got my very own molten lava cake complete with a candle on Sunday! All in all a very nice time. Now it's been a very quiet week for our Pesach this year. Just some pastel and maybe some hard-boiled eggs. And of course, lots and lots of matzah! I hope everyone's having a happy Passover! Happy Hanukkah everyone! This is a quick picture that I snapped Saturday night of one of our menorahs. This one is from my good friend Rachel when we swapped art. In return I made two little dolls for her sweet little granddaughters. I really enjoy the little faces as they sing their songs. 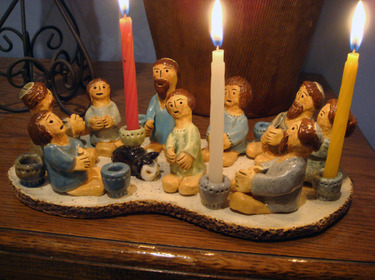 Did you see the little cat that's holding the shamash candle? It's not really laid out in a traditional manner, but it's a beautiful piece of art. Rachel's work is stunning in person. I'll have to ask permission to photograph a few of her pieces the next time we meet for a sewing circle. This year I also found a nice electric menorah for our windowsill. Somehow the thought of candles next to the blinds makes me nervous, but electricity is fine. The little light bulbs flicker like real flames. I'll have to brave the cold one of these nights and take a picture of it. Maybe I'll wait until the eighth night so that you can see it fully lit. This is the sock-monkey quilt for Tina's new baby and these are two Wee Wonderfuls' put-together kitties for my two favorite little girls. I'll have to embroider their initials on the dress after I sew it together. Did you see the little turquoise flower buttons that I received from Petulant Feminine in last month's pincushion swap? I couldn't wait to use them in a project.